Note: "Other household" includes "Visitors only" and "Other not classifiable" households. Note: (a) In 1986, household membership was based on the household in with the person happened to be residing on the night of the Census, rather than on the household in which the person usually resided. (b) In 1996, 2006 & 2011, on the other hand, households were classified according to ‘usual residence’ for up to three residents of a household who were temporarily absent on Census Night. 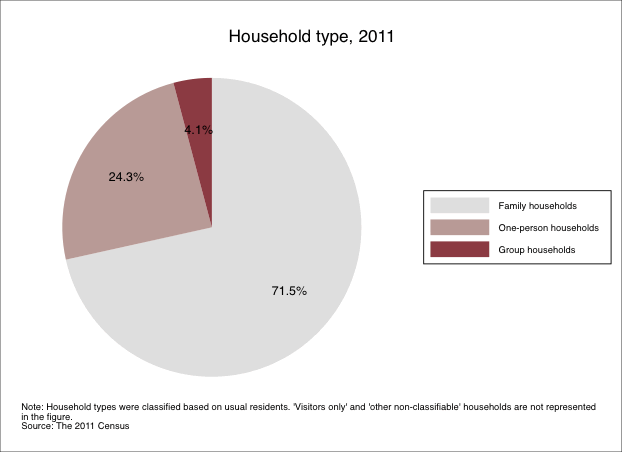 (c) Unlike the Census data for 1986 and 1996, 'visitors only' and 'other non-classifiable' households were excluded in the 2006 and 2011 data. Sources: ABS 1986, 1996, 2001, 2006 and 2011 Censuses. Sources: Hugo, G. (2001). 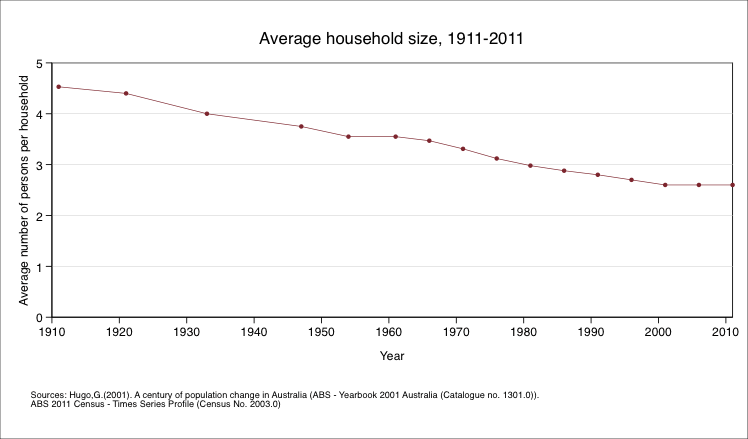 A century of population change in Australia. In ABS - Yearbook 2001 Australia (Catalogue. no. 1301.0). ABS 2011 Census – Time Series Profile (Catalogue no. 2003.0) (T2 & T14). 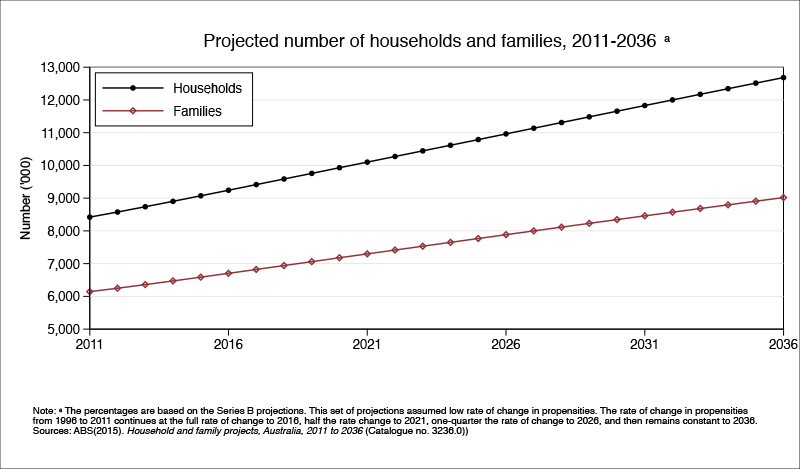 ABS released household and family projection (2011-2036) in 2015. The number of households in Australia is projected to increase from 8.42 million to between 12.73 million and 12.57 million by 2036. ABS produced three projection series with different assumptions: a) living arrangement propensities for 2011 continues to 2036; b) low rate of change in living arrangement propensities; c) the trend in the rate of change in propensities from 1996 to 2011 continues to 2036 (for details see ABS (2015) Household and family projects, Australia, 2011 to 2036). 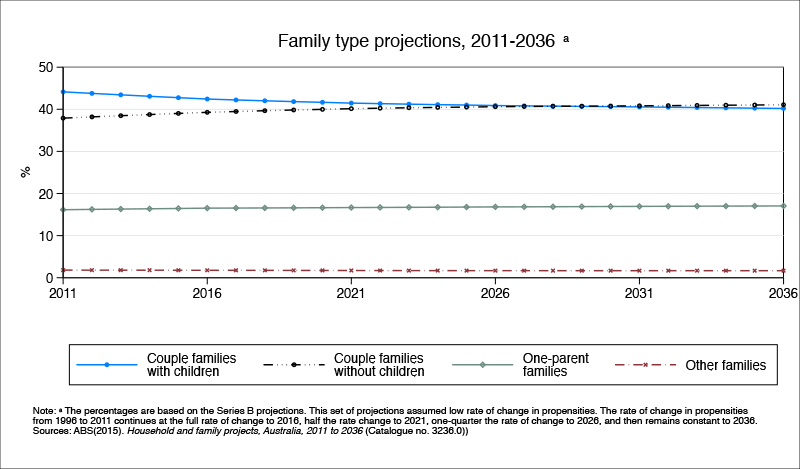 The figure plots the projected number of households and families based on the assumptions of low rate of change in propensities and shows that both the number of households and the number of families will continue to grow to 2036. Note: The percentages are based on the Series B projections. ABS Series B projections are based on the assumption of low rate of change in propensities – the rate of change in propensities from 1996 to 2011 continues at the full rate of change to 2016, half the rate change to 2021, one-quarter the rate of change to 2026, and then remains constant to 2031.